Did you know that raw frozen food can be a great choice for cats and dogs with diarrhea? Many pet owners may be afraid to try raw food if their pet has a sensitive tummy but raw food is highly digestible and can often be the answer you are looking for when a pet has soft stool. Raw food can reduce your pet’s stool size so there is less to pick up too! We have had great results using the Natures Variety Instinct brand. 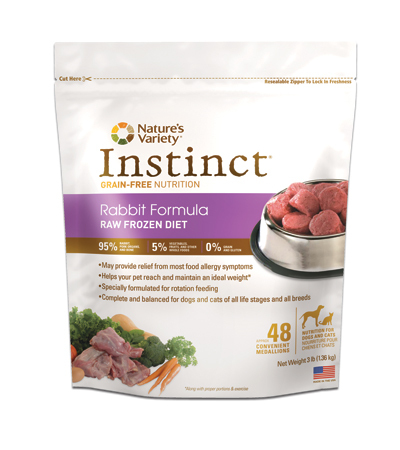 In particular, we especially like the venison and rabbit flavors for pets that have allergies. Introduce the new diet slowly a little bit at a time. For smaller pets, it’s best to start with 1/2 of a 1 oz medallion and even for larger pets, start with 1 medallion per meal. Give your pet a chance to adjust to the new diet and then slowly increase with more raw food each day, using less of your old food. There is a misnomer that you can't mix raw food with other forms of food, but this isn't the case. The raw food is especially helpful for most pets in firming up stool, but you can also try a little bit of canned or freeze-dried too. Pets with chronic diarrhea can also benefit from using the Power Probiotic and Soothing Digestive Relief Formula. The Power Probiotic restores the proper balance of flora and enhances immune health. The Soothing Digestive Relief Formula helps relieve gas, abdominal pain and indigestion. It helps pets better digest nutrients which is very important for pets with diarrhea and malabsorption.